Home » Connectivity » What can we expect at TEDxHarare 2014? What can we expect at TEDxHarare 2014? TEDxHarare is back in Zimbabwe year, bringing with it its inspired talks, intense conversation and networking for attendees of the latest edition of the global movement. TEDx is a program of local, self-organized events that bring people together to share experiences in a manner that follows the world renowned TED talks. ICCO, Trust Africa, Xealos Design, ZAMZIG, Celsys Print,ZOL and Nourish Gourment. So what can attendees expect this year? 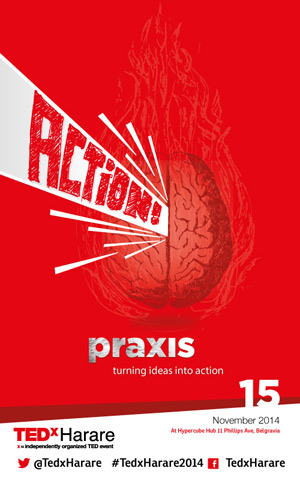 With the theme “Praxis: Turning Ideas Into Action” TEDxHarare 2014 will be promoting more than just discussion as it considers the work that must follow the ideas and thoughts shared. Although registration for Praxis which is scheduled for tomorrow is already closed, people can still apply to attend the TEDxHarareSalon which is scheduled for Tuesday the 18th of November. Under the theme “Shaping New Models” this session will have discussions centred on entrepreneurship and Zimbabwe’s participation in the “Africa Rising” sentiment.